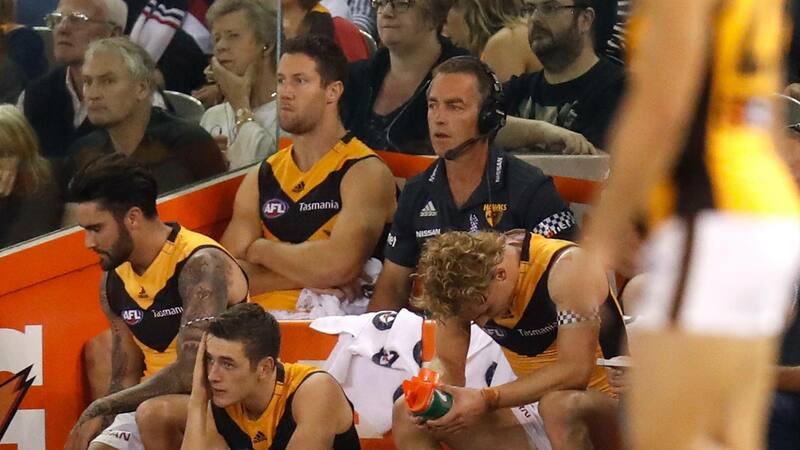 HAWTHORN expects to be without key defender James Frawley for three weeks after he suffered a left hamstring strain in last Sunday’s loss to St Kilda. The 30-year-old is expected to miss games against Geelong, Carlton and Melbourne. “It’s just your standard hamstring. At this stage, he’ll miss three weeks,” club physical performance manager Luke Boyd told hawthornfc.com.au. IN THE MIX Who’s in the running for round five action? Fellow backman and captain Ben Stratton is no certainty to be right either as he battles concussion. Inside midfielder James Cousins hurt his right ankle against the Saints and needed assistance to leave the field, before eventually returning. Cousins, 21, may not be right to face the Cats on Easter Monday. The Hawks expect to regain gun onballer Jaeger O’Meara from a left hip corkie. Liam Shiels should be right to go after his hamstring strain in round six, while champion Hawk Shaun Burgoyne looks to be another week away.